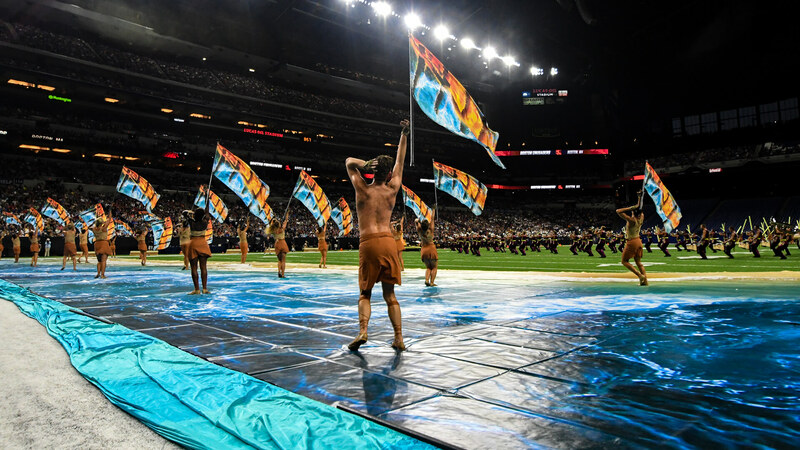 The audience at the 2018 DCI World Championship Finals at Lucas Oil Stadium witnessed Santa Clara Vanguard (1st-98.625) win its first DCI title since 1999 by sweeping every caption except for Color Guard, in which it placed 3rd, just a tenth down from the winning score. On the way to the title and an overall spread of 1.275 over the 2nd place Blue Devils, Vanguard also won a number of major honors, including the caption awards for General Effect, Brass, Percussion, and Visual Performance. Each of those awards is accumulated over all three days of World Championship competition. Santa Clara’s spreads over the 2nd place corps in each total caption was 0.475 in total General Effect (GE 1 and GE 2) over Bluecoats, 0.40 in total Visual (Visual Proficiency, Visual Analysis, and Color Guard) over Blue Devils, and 0.375 in total Music (Brass, Music Analysis, and Percussion) over Blue Devils. In Finals, Blue Devils (2nd-97.350) took 1st in Color Guard. (Boston Crusaders receiving the best Color Guard award was based on the accumulated scores over all three days.) The Devils’ percussion placed 2nd, just 0.05 under Vanguard’s line, but the other two Music captions came in at 3rd in Brass and 4th in Music Analysis. The corps was 3rd in General Effect, 0.50 down to Vanguard, 2nd in Visual Proficiency and 3rd in Visual Analysis. Bluecoats (3rd-96.950) scored only four tenths under Blue Devils by taking 2nd in General Effect and Visual Analysis, 3rd in Visual Proficiency, 4th in Color Guard and Brass, and 5th in Percussion. Carolina Crown (4th-95.500) was 2nd in Brass and 3rd in the other two Music captions. The corps took fourth in General Effect and the two Visual captions other than Color Guard, in which the corps placed 7th. Boston Crusaders (5th-94.313) took 2nd in Color Guard for the evening. 2nd and 1st place finishes in Prelims and Semifinals helped the corps secure the George Zingali Award for Best Color Guard. Boston finished 4th in Percussion and 5th in all other captions. The Cavaliers (6th-93.213) was 5th in Color Guard, 7th in Visual Analysis and Brass, and 6th in every other caption. The Cadets (7th-92.225) finished 6th in Visual Analysis, Color Guard, and Brass, and 7th in all other captions. Blue Stars (8th-90.050) placed 10th in Percussion and 8th in all other captions. Blue Knights (9th-88.925) was 8th in Percussion, 9th in the other two Music captions and General Effect, 10th in Visual Proficiency and Color Guard, and 11th in Visual Analysis. Mandarins (10th-86.150) finished 9th in all three Visual captions, 10th in General Effect and Music Analysis, 11th in Brass, and 12th in Percussion. Phantom Regiment (11th-86.950) was 9th in Percussion, 10th in Brass, 11th in General Effect, Music Proficiency, and Color Guard, and 12th in Visual Analysis. Crossmen (12th-86.750) finished 10th in Visual Analysis, 11th in General Effect, Music Analysis, and Percussion, and 12th in Visual Proficiency, Color Guard, and Brass.